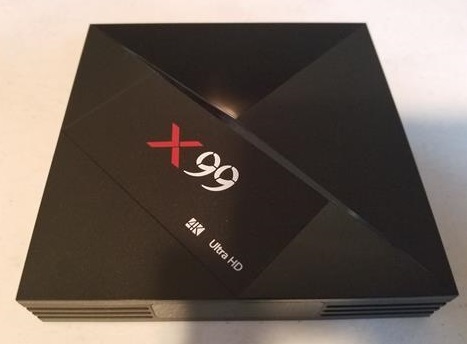 The X99 is a new Android TV Box built to play high resolution 4K UHD videos as well as games and other media. It comes with some impressive hardware with the fast RK3399 CPU and 4GB of DDR3 RAM. 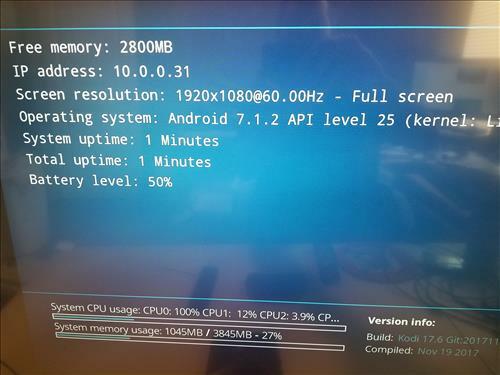 The RK3399 CPU is currently one of the fastest built for Android Boxes and has come down in price recently. This gives it some good hardware which I ran some test on below to see how well it performed. The package comes with the box, power supply, HDMI cable, remote control, and user manual. The side has a SIM slot, Micro-SD, USB 2.0, and a USB 3.0 port. The back has a Type-C port, SPDIF, HDMI, Ethernet, and power port. 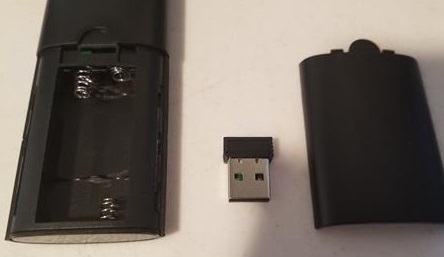 The remote control is a combination air mouse with a small dongle in the battery pack that needs to be plugged into the box. The remote also has a voice button which is a nice feature. Powering the box on a clock displays on the front along with a power light. 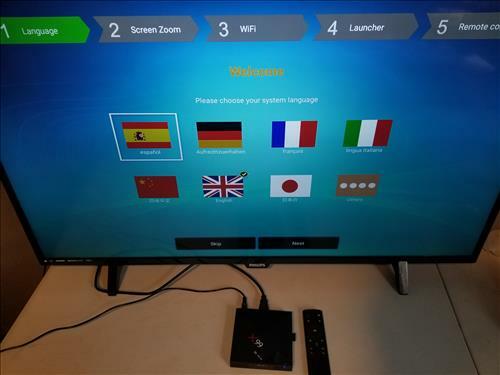 The box comes to a basic setup menu with Language, Screen, WiFi, Launcher, and Remote Control. The Launcher is standard with basic Apps installed such as YouTube, Play Store, Netflix and so on. Kodi does not come installed which is easy to do from the Play Store. I installed Kodi 17.6 Krypton which used very little resources in System Info. I also installed some of the current top Addons such as Neptune Rising which it had no problems with. Testing the unit with Netflix it would only play standard definition due to Netflix restrictions. Netflix requires a box be certified or it will only play 480p and not HD resolution. 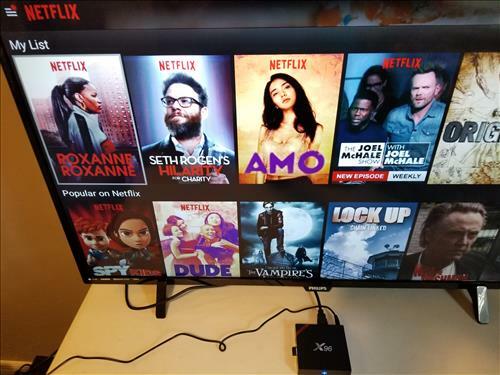 While the X99 has the hardware to play HD 4K video Netflix streams will play at only standard definition. Testing the WiFi I used SpeedTest.net Ookla App which gave some impressive results at 163Mbps Download, and 21Mbps Upload. Running AnTuTu Benchmark Version 6.2.6 gave an overall score of 76606. UPDATE: Others having been getting different AnTuTu scores ranging from 60000-70000. This is likely due to AnTuTu recent updates. Version 6.2.6 was used for testing with no Apps running in the background. Other scores are 3D: 1507, UX: 33855, CPU: 23427, RAM: 3817. I used 4K YouTube videos to test the video resolution and it had no problems playing any 4K UHD videos even at 60fps. The X99 comes with some nice hardware for streaming videos and did not disappoint. 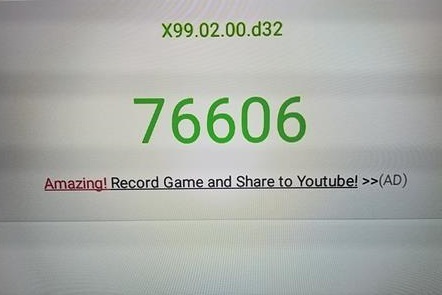 The AnTUTU score of 76606 is very good even higher than the Fire TV without the restrictions. It will have no problem running Kodi, Netflix or most any other video streaming App. 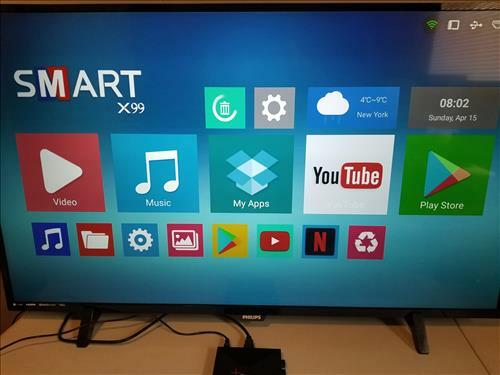 Bought this X99 android TV Bo, 5 weeks ag, to connected on 40 ” Samsung, smart TV, newer started to work.. cheers.. Quantum.. I have a x99 box. When I put a build on it it works fine,turn it off and return later and switch it on again it is on kodi . The build is still in repositories but I have to reload it .I do notice after reloading the build if I put it back to kodi and turn it off then turn it on again it comes back on my build.Any clues . Why DTS HD, TRUE HD, ATMOS doesen’t work?? Hi there, does the sim slot really work? Because the sim slot on my X99 is way too big to fit any type of sim that’s available in the market! X99 is the best box. 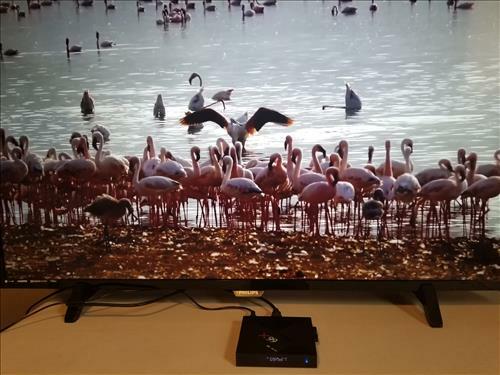 It flies & it uses 64bit kodi. It has a bad fork installed. Either reset box or install Chief Kodi 64bit build. It will solve all your issues. After getting my X99 box, it set up and ran flawlessly until my airmouse remote quit and could not be paired to the unit. Since getting a replacement airmouse remote there are no problems and this unit runs perfectly, with very fast downloading. The extra RAM really comes in handy if you have a lot of apps and you can do a lot more customization on this box than Nvidia Shield with just about the same level of performance. I’d recommend this box as a streamer over just about anything else out there other than Nvidia Shield. Perderá dinheiro pelos seus problemas. 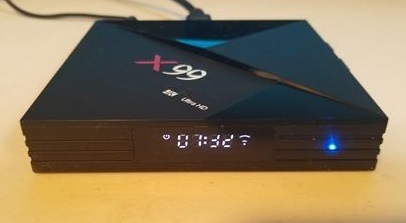 Seondo voi dovendo comprare un tv box quale comprereste tra x99 e h96 . To be hornets 60000 is very very low. Must be something wrong with your box. I got around 80000 for my X99 box. 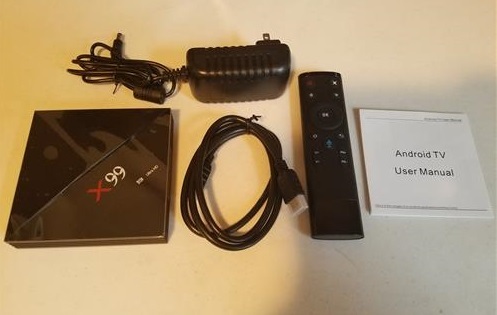 I have the same Android TV Box „X99 Max 3399 with Android 7.1.2“. I have change all the Screen Resolutions from „Auto till 4096x2160p“ also with Other HDMI Cable, from 2.0/2.0a and 2.0b. But almost Every „4K HDR“ Movies that i want to Play with it, it do NOT PLAY with Real „HDR or HLG“. I have a LG OLEDC6D with HDR, HDR10, HLG and Dolby Vision. With my Other Android Device „NVIDIA SHIELD TV“ and i have a „Minix U9“ and Both „CAN Play Real HDR and HLG“. But with this „X99 3399 Android Box“ i can‘t Play HDR or HLG Movies. If some of you have any Solutions „HOW I CAN PLAY 4K HDR & HLG Movies“ Please Reply/Help me. People its not the rock chip its the build with a bad fork installed. You can try to reset box as soon as you get it cause I think some Chinese guy put a fork on box after mfg. Or install Chef Kodi 64 bit or install a different fork yourself. I would reset via botton in back. Worked on my X99 box which flies! Really fast box with no problems. S912 cpu is nicer but only 32 bit builds are out. I told you guys the x99 has a BAD fork installed which is why when you reboot it reverts back. Go find Chief Kodi Build install that it will install a new fork! Problem solved! I have given up on these Android boxes and Gearbest as well. I will only buy locally where I can return the item without hassle. From my experience, there’s too many counterfeit and cheap chipsets that render the box useless. Most recently, I had a bad with the H96 Pro+ by Alfawise. Reviews seemed good until I googled the issues I was having. Then all sorts of issues popped up. Instructions to reinstall the factory firmware are lacking too and you need to take the box apart to see what chipset there is. I’m done with these Android boxes. 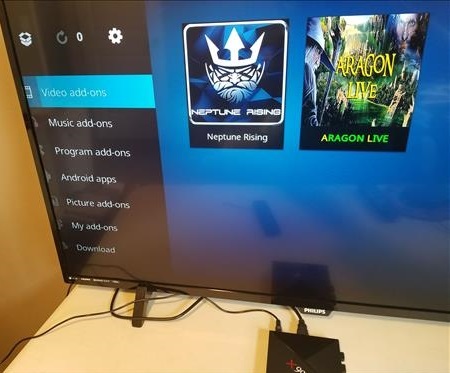 I will only buy a premium Android Box like Evpad or use my laptop connected to my TV. I am having a problem with kodi. It will load a build and appear to run fine, but after a day or so, kodi loses the build info and reverts to a first run state. Also happens on a power cycle. I also have an H96 Max with the same build, 7.1.2. It does the same thing with kodi, so I am thinking this is maybe an rk3399 platform problem. Another disappointment is middling antutu scores in the low 60000 range. I am going to experiment with some cooking techniques to see if it is a thermal related issue. Another problem is losing setups on alternative launchers like nova. It will appear to set up fine, but after a few starts will lose the widgets and I have to start over. I do not recommend this box. The H96 Max is much faster with fewer bugs. Dont buy this unit ever! Kodi addons! so you wont do it power-off with this device;like a “joke”! First I’v tried to load BUILD but when I’v power-off than all addons gone for ever! I did power-off device than lost/deleted all my addons again! Kodi still remain but your all addons lost so never power-off this device! Seems that RK3399 does not stable work with Kodi! There is a lot of BUGs! I have a X99 with the same problem as you. Kodi 17.6 does not work. Avery time I disconnect the box from the power supply, I loose everything that I have installed on Kodi. This box has a serious problem and I hope there is a upgrade to fix this problem. You’re right when using kodi 17.6 powering off you will lose all add ons. I installed XBMC 18, which is essentially kodi 18, and I can power off the box no problem all my add ons and data remain now my box works great. It’s WBMC 18 not XBMC 18, sorry. Bit surprised to read all the negative comments about my box and setup. I have H96 Pro+ with Kodi 17.6. Never a problem. Switched off every night, on again every evening, no loss of addons or selected favourites. I did install a ‘magic’ rebuild which I hated, so uninstalled Kodi, reinstalled 17.6 and had to redo all my addons and favourites. Absolutely no problems. I’d recommend to anybody. Hi, Thanks for sharing with us. Hi,I like your links and it help me a lot. If you find any way to addon zemtv for desi programs. I will appreciate your help.